The 2447, in any guise, is a reference hardly needing introduction. It is the model which set Heuer en-route to its present state. It’s an uncompromisingly bauhausian aesthetic with true purpose. There’s no secret that I have a soft spot for it and most of vintage Heuer. If I had to feature one reference on multiple occasions, I’d be remiss if it weren’t this. The case is 36mm with a very shallow rise. The every-so-slightly brushed dial sports the applied indices like a match made in heaven. The manually-wound column wheel Valjoux 72 gives owners a chance to bond with the mechanics. All things considered, it is a staggering recipe. This example is from the vintage watch collective. It’s an early reference with the one-hundred part or ‘d’ decimal dial. The dial is unspotted, the case unpolished, and the movement without corrosion. 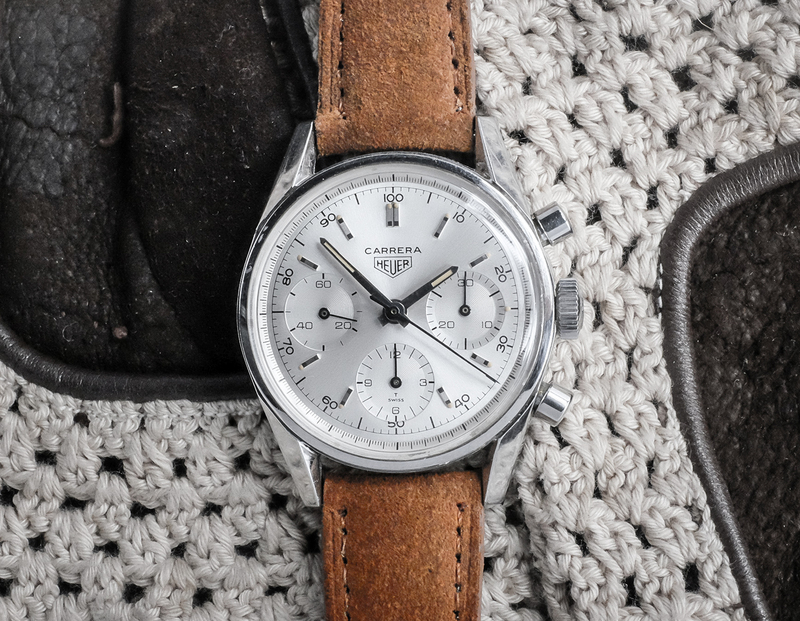 I’s a rare opportunity to own what is a justly sought-after and gorgeous chronograph, not yet spoiled by time. Find it here for 14000 EUR.